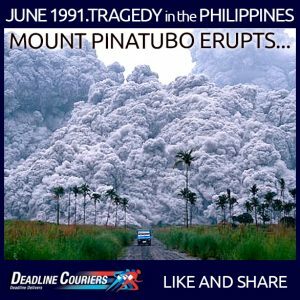 Today, 12th June, 24 years ago in 1991, and after lying dormant for almost 500 years, the volcano Mount Pinatubo erupted on the island of Luzon in the Philippines resulting in one of the most destructive volcanic eruptions of the 20th century. Before the eruption, Mount Pinatubo (just 55 miles northwest of Manila) was covered with tropical vegetation and was home to more than 30,000 people who lived in villages on its slopes. The Philippine government and the American military were able to carry out a timely evacuation of the population, saving thousands of lives and millions of dollars in property damage. However, the eruption killed up to 800 people and displaced thousands more by burying the surrounding land with thick layers of ash. The volcano today is a safe place to visit. The crater of the volcano is a beautiful lake that is 2.7 kilometers wide and the water is crystal clear. Trekking Mount Pinatubo is a popular activity among locals and foreigners alike. The mountain is located only about 3 hours away from Manila. It is easy to get there by oneself but it is best advised to join a tour. With well over 12,000 Filipinos in Ireland, many working on the Health, Tourism and IT sectors, we at Deadline Couriers understand the strong connections between Ireland and the Philippines. Our International delivery services are always ready to organise any parcel delivery to and from Manila and Dublin or any other major Irish City, because we understand being away from home is not always easy. With thanks to mountpinatubo.net for Mount Pinatubo’s details.